Concrete pools need to be resurfaced every 10 to 15 years. While it may be possible to delay resurfacing projects for a swimming season or two, sooner or later the damage caused by time, weather, and use are going to catch up to your pool. The problem is that pool resurfacing takes time. Depending on the size and shape of the pool, a resurfacing project may last anywhere from a few days to a couple of weeks. And during that time, the pool is out of service. So when is the best time to schedule your pool resurfacing project? In most other places, that question is easily answered: When it’s too cold to swim. But in South Florida, the weather is often warm enough for swimming all year long, including the middle of winter when everybody else is freezing cold. In fact, mid-winter is often one of the busiest times of year for South Florida swimming pools. That’s when visitors from up north make their way to our sunny climate to avoid the cold and snow back home. Scheduling a pool resurfacing project in mid-winter may not be practical. But if your pool can’t go another swimming season without resurfacing, it may be necessary. Similarly, mid-summer isn’t always the best time to schedule your pool resurfacing. That’s the time when your pool offers the best escape from the heat and humidity. So when should your pool be resurfaced? If you have the luxury of scheduling it, the best times for resurfacing are the “shoulder seasons”, or the time between the peak pool seasons of mid-winter and mid-summer. 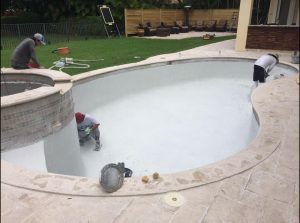 Early autumn or late spring are the busiest times for pool resurfacing in South Florida because that’s when pool owners want to get their swimming pools in shape for the upcoming busy seasons. While the timing of your pool resurfacing may vary, there’s one thing that’s always predictable: Eagle Pools. We specialize in pool resurfacing and other common pool repair projects all year round.